Last month, ad tech took over New York, but now it’s Paris’ turn! 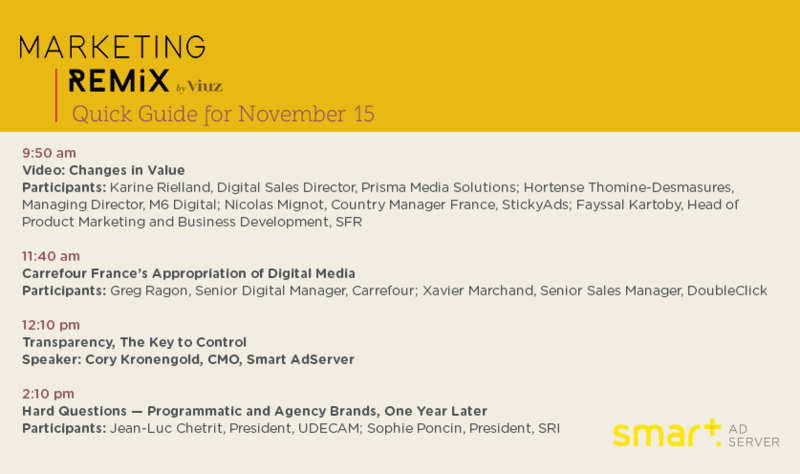 The Viuz Marketing Remix is back, and serving up the best in digital, data, and programmatic. The day-long event takes place in a cozy basement theater in the city center, and speakers include digital data consultants, publisher-centric ad tech platform execs, and reps from big players like Google, AOL and Yahoo!. Smart AdServer’s CMO Corey Kronengold will be addressing the impact these giants have on publishers in his speech, Transparency, The Key to Control. But which other sessions shouldn’t you miss? Use our list of the best talks for publishers to guide you through the day! Short on time? Check out our Quick Picks below! -Sebastien Noël, Director of Sales, Yahoo!